I'm not going to lie- I've always been pretty scared of swimming in any water other than a pool. I have these super nerdy water shoes I'm always wearing. I was in luck though in Crete. I had never seen anything so incredibly clear! The Mediterranean was ice cold after being out in the blistering sun. We grabbed some googles and set off exploring every day. It was a whole new world for me. We would trek away from the touristy beaches in search for a private cove without a soul in sight and would swim around for hours. I have unwillingly accepted the title as "most annoying person to travel" because I always push to be at the best spots for sunset. My friends always thank me in the end though. As a photographer, I have found myself on many trips waiting for the colors to appear as the sun goes down, but many times I'm left with a cloudy, colorless display. Although in Crete, not even one night (out of our 12) was a disappointment. Whether I was on a beach, in a village, or in the mountains, every night dazzled for us. I've said it once and I'm sticking by it. Greek people are, from my experiences, the friendliest in all of Europe. Not only are they super friendly and helpful, but also have a great sense of humor. A few nights we ended up at a bar with locals and I became fascinated learning about the every day life and culture of the people there. Most people would see an image from these beaches and think... "totally photoshopped. No way! There really ARE pink sand beaches." I am also guilty of it. But to my sheer bliss, I found them to be REAL. I could barely believe my own eyes. As a girly girl who has always loved the color pink- I was walking around in a dream. Chania, Agios Nikolaos, and Rethymnon are all must sees on the island. These ancient venetian harbor towns all have stunning architecture and unbelievable views. They're jam packed with family run authentic Greek restaurants around every corner. The boutiques are unlike others in touristy European towns. They aren't cheesy giftshops but instead have beautiful artisan textiles, hand-painted pottery, and handmade goods. Some of the beaches are not for the faint hearted (... like myself.) The hikes are treacherous and steep but once you reach the beaches- they're mind blowing. The one pictured above had no restaurants, no toilets, no lounge chairs and umbrellas for rent. Just purely off the radar, completely free, and one of the craziest places I've ever been. Also not the easiest place to get to but I'm starting to realize the best places never are. You drive 30 minutes on a one lane, cliff side, dirt road all the way to a deserted parking lot. From there you walk another 30 minutes before you can even get a glimpse of the gem itself. We spent our last afternoon on the beaches here until we were the last ones left. A lot of the ships (with all the tourists) set sail around 6pm so you're left the rest of the evening with only the sounds of the ocean waves rolling in. We hiked all around, swam in the crystal clear coves, and watched the sun go down. This is a drone photo of the Balos Beach from above. The backdrop from the cove is a giant mountain range that covers almost half the island. All of the harbor towns also are engulfed in the steep mountains, only making everything that much more picturesque. I always ask people, "which do you prefer the most, beach or mountains?" But on Crete, you don't have to choose. You can have both in one day... or every day for that matter. We spent 3 days in an Airbnb in a tiny village, barely on the map. I immediately fell deeply in love. I would wake up early to go on walks, greeted by the alley cats and the friendly neighbors. I walked amongst the locals in their Sunday best as the church bells rung. Every evening I would set out again after dinner. As it was summer, everyone had their doors open with the sounds of the music or laughter filling the streets. From gorges, to wineries, and mountain tops, to the sea floor- Crete is a place I could spend the rest of my life exploring. Typically after a trip I feel like I've seen enough, and don't need to return anytime soon. Crete was different somehow and I cannot wait to return again someday. 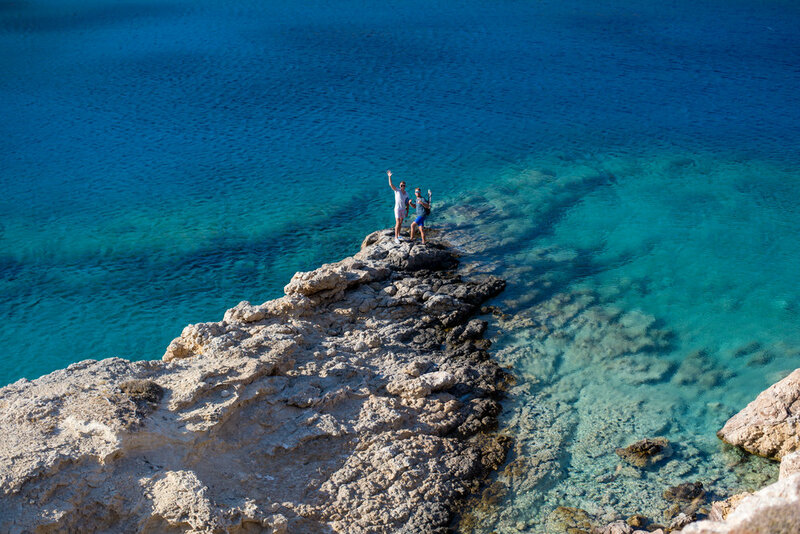 Between the delicious food and the kindness of the locals along with the extraordinary beauty, I deem Crete one of the special places on earth. To be fair, it is right in the middle after all.